Kirklngton Hall is not a particularly well-known house and its history has never been comprehensively recorded. For around 350 years it fulfilled its primary role as the residence of the Lord (or Lady) of the Manor but then, like so many big houses, it struggled to find a role in the post WWII period. The Kirklington Hall we see today was extensively remodelled and enlarged in 1904 but the Jacobean style exterior conceals a much earlier house. According to a survey carried out in 2009 by Trent & Peak Archaeology, the structural core could date from the 17th century and may be the remains of a house built by John More, Doctor of Physic. Dr More passed the estate to his daughter Winifred, and her husband Thomas Heneage sold it (together with the nearby Hockerton estate) to Lieutenant Colonel Thomas Whetham in 1736. Kirklington Hall was to remain mostly in the Whetham family’s ownership until the end of the 19th century. John Whetham was responsible for remodelled Kirklington Hall in the 1770s and improving the estate. Two interesting estate maps (held at Nottinghamshire Archives) survive. The earlier map of 1766 by surveyor Isaac Messeder shows the compact grouping of the hall (surrounded by a bowling green), stable yard and kitchen garden. The parkland contains very few features, apart from the lake. By contrast, a later map of 1774 by landscape gardener William Emes shows many improvements, such as the serpentine lake and clumps of trees. These features were typical of Emes’ style, which was very similar to that of Lancelot “Capability” Brown. A very interesting feature shown on Emes’ map is the separate “Banqueting Room”, located some distance from the house and accessed via a new path or “Ride”, which took visitors from the stable yard, past the dog kennels, and over the lake. We don’t know whether all of Emes’ plans were implemented but clearly enough was done to attracted favourable comments from topographers. The earliest illustration of the hall itself appears to be an engraving of 1796, published in Thoroton’s “History of Nottinghamshire” volume 3 (1797). Although we must accept that this depiction of the house may not be completely accurate, it shows the west elevation of three storeys with two projecting bays and embattled parapet and reflects the fashionable Gothick style of the period. 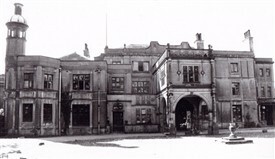 Leonard Jacks in “Great houses of Nottinghamshire”, describes “a big solid house, with white walls, which gleam through the surrounding trees” indicating that the exterior of the hall was probably stuccoed. John Whetham died in 1781 and his widow Elizabeth continued to live at the hall until her death in 1808. As there were no children from the marriage, the estate was inherited by Admiral Frank Sotheron (1765-1839), the third son of William Sotheron of Darrington Hall, Yorkshire. The Admiral had a long and distinguished naval career and also served as MP for Nottinghamshire. A tablet in the local church pays tribute to his character, describing him as “an intelligent landlord, a friend of the poor, a warm hearted neighbour, and a most affectionate father”. The reason behind the inheritance can be traced back to the Vice-Admiral’s father’s aunt, Mary Thompson. Mary was the sister of Lucy Thompson, who had married Lieutenant Colonel Thomas Whetham. After the death of Vice-Admiral Sotheron in 1839, the estate reverted once more to the Whetham family’s ownership and Major General John Whetham took up residence with his wife Susanna Ann . Their daughter Maria Agatha Whetham (1818-1894) subsequently lived at the hall with her husband Colonel Alexander Boddam-Whetham (who was born Alexander Boddam but took the name Boddam Whetham in 1870). After her husband’s death, Maria Agatha appears to have lived on and off at the hall until her death in 1894. Other residents (most likely tenants) during this period included J. Philips Esq. JP (in 1889), Mr A F Pollock, a solicitor (in 1891), and Hugh Rose (in 1894). A description of the hall’s interior during Mrs Boddam-Whetham’s time appears in “Great Houses of Nottinghamshire” (1881). The author Leonard Jacks describes “a long drawing room, liberally ornamented, with a kind of door-window on one side, and an abundance of glass on the other; with comfortable dining room, a library of fair proportions, a billiard room with appliances for playing that favourite game, and a suite of fine rooms upstairs”. Curiously, Mrs Boddam-Whetham did not know the identity of the people depicted in the portraits hanging on her walls, as the pictures had previously belonged to Admiral Sotheron. The hall was sold to Thomas Craven in 1903 and he employed the architect George Faulkner to remodel and extend the house in 1904. The alterations completely changed the exterior of the house, giving it a mock Jacobean appearance. The embattled parapet disappeared and a number of ornamental features were added including balconies, a tower, and leaded glass windows. Little appears to have been written about Thomas Craven, other than that he was High Sheriff of Nottinghamshire in 1910. The next owner was Oswald Bainbridge, a director of the Blackwell, Bolsover, New Hucknall, Newbiggin, Wharncliffe, Silkstone, West Mickley and Princeton Colliery Companies. Sadly, Mr Bainbridge died in 1915 at the age of 36 from injuries sustained in a fox hunting accident the previous year and his widow, Hermione, inherited the estate. By 1920, the hall had a new owner - Sir Albert James Bennett - who took up residence in 1920. Born in South America, Sir Albert moved to England just before the First World War. In addition to his career in the nitrate and mining industries, he took a keen interest in politics, acting as Member of Parliament for Mansfield from 1922-1923 and Nottingham Central from 1924-1930. He was created first baronet of Kirklington in 1929 but shortly after, bankruptcy forced him to resign his Parliamentary seat and sell his home. The Kirklington estate, together with Hockerton, were put up for sale at the end of 1929. The sale catalogue gives us a detailed tour of the accommodation on offer. The front hall had a decorated plaster ceiling (divided into panels by carved oak beams), oak panelled walls and a carved oak chimney-piece. Other ground floor rooms included a library with fitted bookcases, billiards room, drawing room and dining room - all panelled in oak with parquet flooring. By contrast, the drawing room was decorated “in the graceful style of the Adam period” and had a ceiling with delicately modelled plaster oval panels, a cornice decorated with swags and pediments, and an Adam style fireplace with centre panel depicting children at play. Many of the reception rooms had doors leading directly to the verandah and pleasure grounds. 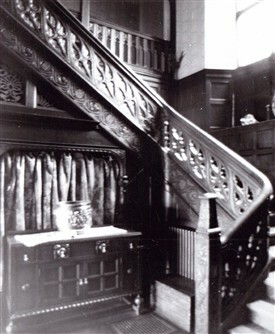 The oak staircase led to seven “best” bedrooms, a dressing room, and three bathrooms. Curiously, one of the bathrooms had direct access to the billiards room below, via a spiral staircase. There were five guest bedrooms and – shut off by a swing door - a suite of servants’ rooms, comprising maid’s pantry, heated linen room, servants’ bathroom, flower room, housemaid’s sitting room, cook’s bedroom and six further bedrooms. The “domestic offices” were very extensive and remind us that an army of servants was required to run a country house of this size. Rooms included the butler’s pantry, housekeeper’s room, and kitchen. Adjoining this was the gun room (with footman’s bed over), log shed, brushing room, cycle house, coal shed (capacity approximately 20 tons), and boiler house (with “Robin Hood” boiler). In addition to the crescent-shaped lake, other features of the pleasure grounds included thatched sheds, summerhouses, sunken garden with lily pond and fountains, tennis and squash courts, two kitchen gardens, five greenhouses, gardener’s bothy, stabling, groom’s cottage, heated garage. The hall was purchased by Lady Eveline Maude Robinson, widow of Sir John Robinson, founder and chairman of the Home Brewery Company and celebrated racehorse breeder. She herself was a successful breeder of Aberdeen Angus cattle and won many championships. Like many large houses, Kirklington Hall was requisitioned during the Second World War, forcing Lady Robinson to retreat to a small suite of rooms. After her death in 1944, the Kirklington estate was put up for sale in July the following year. Kirklington Farms Ltd purchased the hall for £24,500 but soon sold it on, to the Anglo-Iranian Oil Company (later British Petroleum) in 1946. The company - a subsidiary of the D’Arcy Exploration Company which had developed the oil field at nearby Eakring - used the hall as a production and geophysical research centre. The company made improvements to the house by installing oil-fired central heating and an electrically equipped kitchen. When Kirklington Hall came up for sale again in 1957, the surrounding grounds had been reduced to just 11½ acres and its conversion from home to research establishment was only too evident as the entire ground floor had been divided up to form offices, laboratories and a library. Instead of comfortable bedrooms, the first floor accommodated yet more offices and laboratories, and two canteens. The third floor had a photographic room and a self-contained flat. The asking price was £12,000. For a while the building’s future looked bleak and demolition - a very real and constant threat to the country house in the post WWII period – loomed. 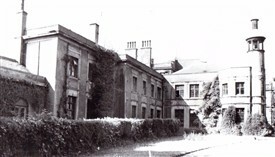 Thankfully in 1958 the Rodney School bought the house and remained there until 2006. 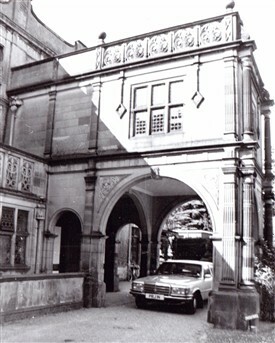 The school attracted attention from the national press in the early 1990s, when it emerged that it was the only school in Britain to cane its girls (as well as its boys). After the Rodney School’s departure, the hall again lay empty until another school, Wings – which provides education for children who cannot attend mainstream schools – moved in, and they remain the current custodians. This page was added by Website Administrator on 09/03/2015. OurNotts has received an email mentioning another tenant which perhaps fills the gap between Maria Agatha Boddam-Whetham dying in 1894 and Mr Vivian Bond in 1900. It is a John Ramsden Armitage, a prominent Bradford wool merchant, who died on 30th January 1899 when he is believed to have been renting Kirklington Hall. a death notice for J R Armitage from the Yorkshire Evening Post of 3rd Feb 1899 says he died at the Midland Hotel London (St.Pancras Hotel? ), being a "JP of Bradford and of Kirklington Notts"
Further to the Comment above, we have now found the report of J. R. Armitage's death from the Newark Advertiser (8th February 1899 p3 c3). It reads as follows:- "The death occurred somewhat unexpectedly at the St.Pancras Hotel, London, on Monday evening week of Mr. J. R. Armitage of Bradford and Kirklington Hall, Newark. Some time ago Mr Armitage suffered from a serious illness, but he appeared to have practically recovered. He did not gain strength rapidly, however, and though he resumed his ordinary duties he was manifestly ill. He was present and spoke at the annual meeting of Lister & Co. (Limited), dyers, on the Tuesday previous to his death, and subsequently travelled to London where he was taken ill. On Saturday week he underwent an operation, but sank and died as stated. "In public life Mr. Armitage was best known as a sound Conservative and Churchman. Many years ago he sat in the Town Council of Bradford, and was then invited to accept, but declined, the Mayorality. He was for many years the head of the firm George Armitage (Limited), dyers, and on that firm being absorbed by the Dyers' Association he undertook the chairmanship of the new amalgamation. He was a director of Lister & Co. (Limited), and in commercial circles had very great influence. Privately he was a genial, good-hearted man. He was an enthusiastic Freemason"